Diao ye zong’s album for Comiket 94 announcement! Today is June 8th and I’m posting this announcement. 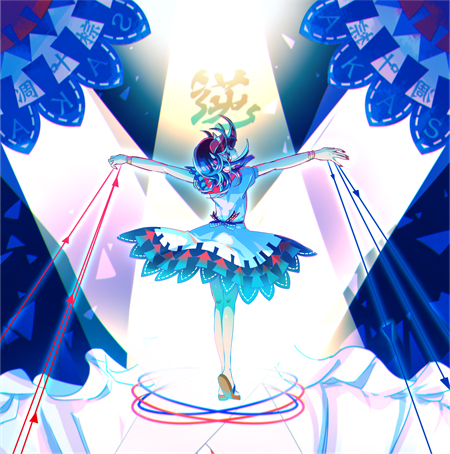 This is a Touhou multi-genre arrangement album brought to you by Diao ye zong. The theme is ‘reversal’! From the earth to the sky. And, from the sky to the earth. Send them all in nine songs, reverse the hierarchy​, also the shocking stories! Diao ye zong xin gửi đến các bạn, một album gồm nhiều bản arrangement đến từ Touhou. Chủ đề lần này là ‘sự đảo ngược’! Từ cõi đất lên đến bầu trời. Và từ bầu trời xuống cõi đất! Gửi gắm tất cả trong chín bài hát. Đảo ngược mọi trật tự, và những câu chuyện đầy bất ngờ! No more, anymore? More more?! Hết rồi, không còn nữa? Thêm nữa, thêm nữa đi?! Original title: Secret God Matara ~ Hidden Star in All Seasons. Today, circles announce their locations in C94. And surprisingly, RD announces his new album too! The album illustrator is not Hanada Hyou… とってつき is in charge of the artwork this style. If I don’t look at the credits, I wouldn’t know that a different illustrator drawn it. The artstyles are quite similar. Most Crazy Backup Dancers arrangements are cheerful, rush and always give the vibe that Satono and Mai is putting up a show. So does 至天. A duet from Merami and nayuta~. And if you listen carefully to the demo, you could notice those Merami’s high notes. nayuta and Merami both have the ability to be ‘lunatic’ in some RD songs. I mean, they express the craziness very good. For, ノーモア、エニモア？モアーモア？！, although that is a Reimu song but I have the feeling when listening to other Marisa songs… I don’t know why. The title seems intense. 異聞『正義の味方』 is probably taken from sasage’s 輝針 「セイギノミカタ」. This might be an “alternate” version. We have a new lyricist here, とものは. Based on the crossfade, the lyrics still have some parts from セイギノミカタ. So far, I still prefer the old version in sasage more. But let see, maybe the new lyrics would have something for us to pay attention to. An orchestral track, 交響詩「魔帝」より　Ⅱ．神話幻想. You could easily guess the genre from the title. I usually don’t listen to the instrumental track, but I’m loving this one. When I first read the title, I was hoping it would be a storytelling track or something like that. Too bad it only stops at a regular arrangement. Enslaved, based on Seiga’s theme. Sign me in. 語九十九節 reminds me of 狂言「九十九星降」 from tsutae. That’s just me. The contents may be unrelated. Folk-ish arrangements. Duets from nayuta and Merami. Really, really reminds me of -tsutae-. THE ALBUM IS ON SALE!! HOW ABOUT BUYING IT ASAP?!!! AVAILABLE NOW ON MELONBOOKS!